Most often, backyard barbecues are fired up to cook meat – burgers and steak, generally – and almost always used at dinnertime. It’s a shame that such a useful cooking tool rarely sees its full potential – outdoor grills provide high, direct heat that’s ideal for cooking much more than burgers. The fact that cooking outdoors doesn’t heat up the house makes me want to use it all times of the day – including the morning, on weekends when we linger over breakfast. All types of bread work here, but make sure it’s cut thick – sourdough, multigrain, challah and raisin bread are all delicious, or try cinnamon buns, cut in half crosswise. Whichever bread you choose, it should be at least a day old – fresh bread tends to make mushy French toast. 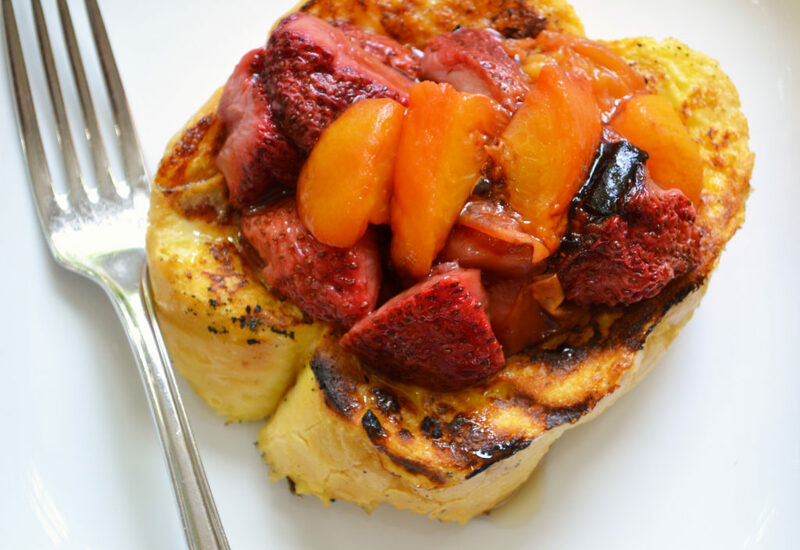 To top it off, grill some peaches, mango or other juicy stone fruit – cut in half or in wedges, pit them and place cut-side down on the grill until softened and grill-marked. Slice overtop, letting the juices mingle with the maple syrup. In a shallow bowl, stir the eggs, milk and vanilla together with a fork. Brush the grill with oil and preheat it to medium-high. Dip each slice of bread in the egg mixture, coating both sides well and letting it soak in. Pick up the slices and let the excess egg drip off; then place them in a baking dish to take them outside. Sprinkle them with cinnamon if you like. Grill the French toast until it’s until on both sides, about 2 minutes on the first side and 1 minute on the second, flipping as necessary. Close the lid to create an oven environment, which will help them cook through. Serve them right away with syrup and fresh fruit, or keep them warm on the top rack of the grill or in a 200°F oven while you cook the rest. If you live on the prairies, chances are you’ve had saskatoons in something – pie or jam, probably, and maybe even in sweet peroghies. Saskatoons (the city was named for them) are hardy shrub berries, less juicy but similar in look, shape, colour and flavour to a blueberry, with more pulp and slightly thicker skins. Botanically, saskatoons are in the same family as roses and apples; the wee purple ones come into season sometime around August, and if you don’t have a secret picking spot, keep an eye out for them next time you’re out on a hike or at the dog park. Some local grocery stores sell them frozen, too. There is perhaps no dish more prairie-influenced than peroghies stuffed with saskatoons. Eat them for dessert, boiled and then cooked until golden and crisp in a hot pan with butter, topped with sour cream, crème fraîche or vanilla yogurt. They’re also delicious for breakfast or brunch. On a trip to Waterton last weekend to help kick off the third annual food festival (it’s on now, until June 4! ), I was thrilled to finally visit Waffleton, the new(ish) waffle shop founded by the creators of Wieners of Waterton. 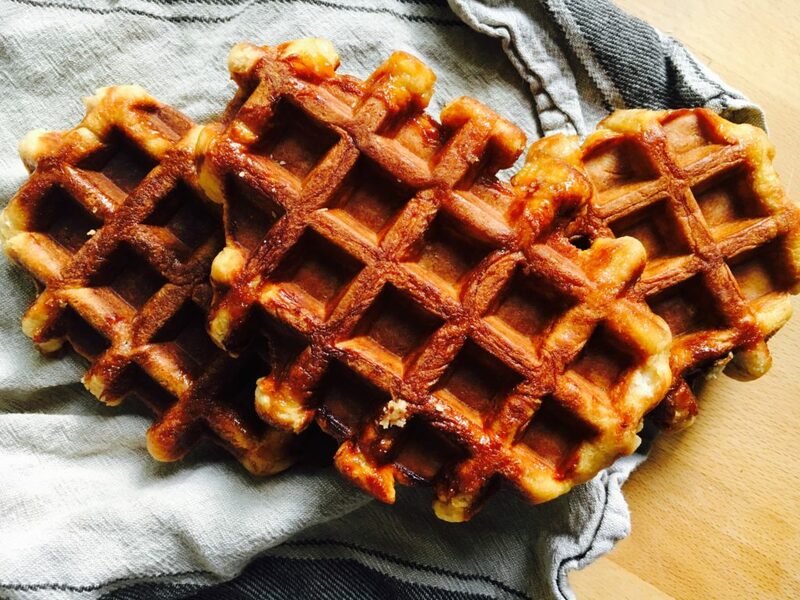 Not only do they have divine buttermilk waffles made with batter they raise overnight, they also make real Liege-style waffles, which are dense and chewy, made with rich, buttery brioche dough and pearl sugar. I’ve always wanted to give them a go, and so I finally managed to – they’re easier to make than you might think, and definitely worth the effort. If you can’t make it to Waterton (a wonderful summertime destination), make some at home like they do at Waffleton – topped with sliced strawberries and whipped cream. This seems like a classic Best of Bridge recipe – homemade doughnuts made from a recipe handed down over generations. After all, you only make doughnuts when you have friends and family around to eat them. 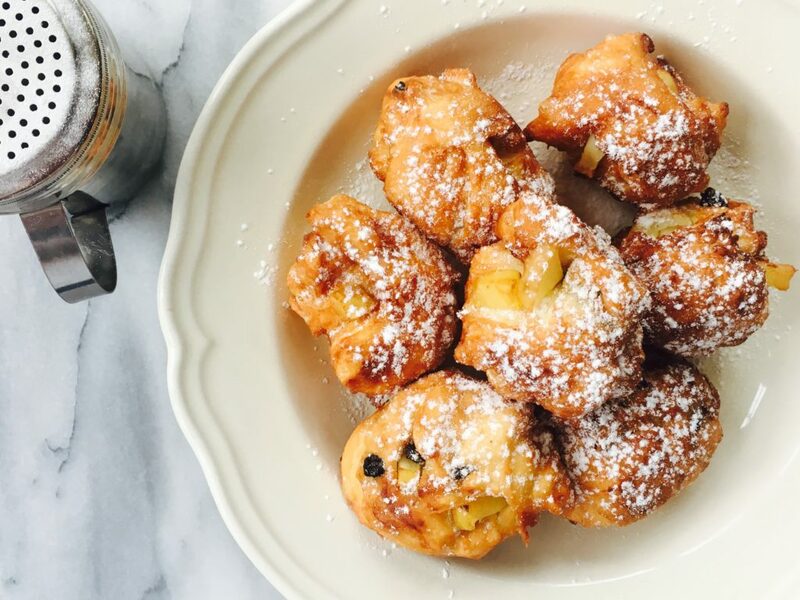 Olie Bollen are traditional Dutch apple and raisin fritters – the easiest kind of doughnut to make. There’s no need to roll and cut them, you can simply drop spoonfuls of dough into the hot oil and fry until golden and crisp. Experiment with other fruit in season, too – ripe peaches are delicious, just pat them dry if they’re overly juicy. 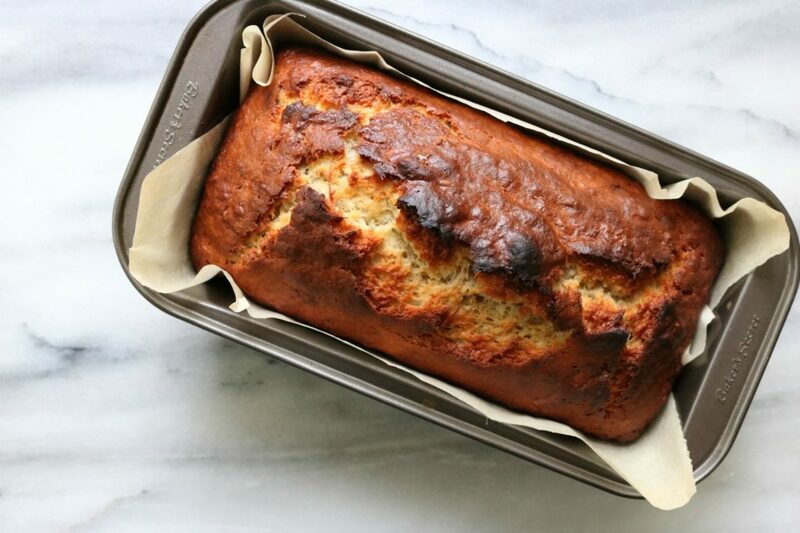 This recipe comes from a friend of a friend of a friend, who says it was her grandmother’s specialty. Serve them as an after school snack if you have extra hungry kids in the house, or for brunch when you’ll have more people around the table. 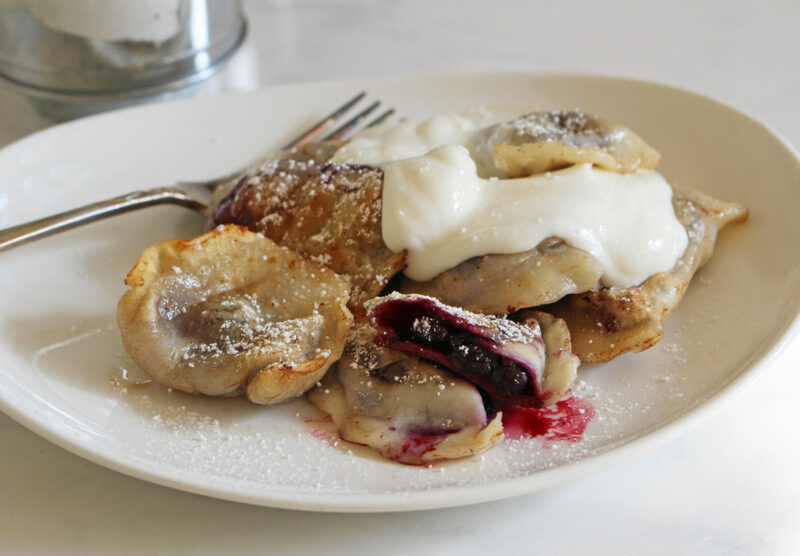 They’re best warm, doused in powdered sugar. 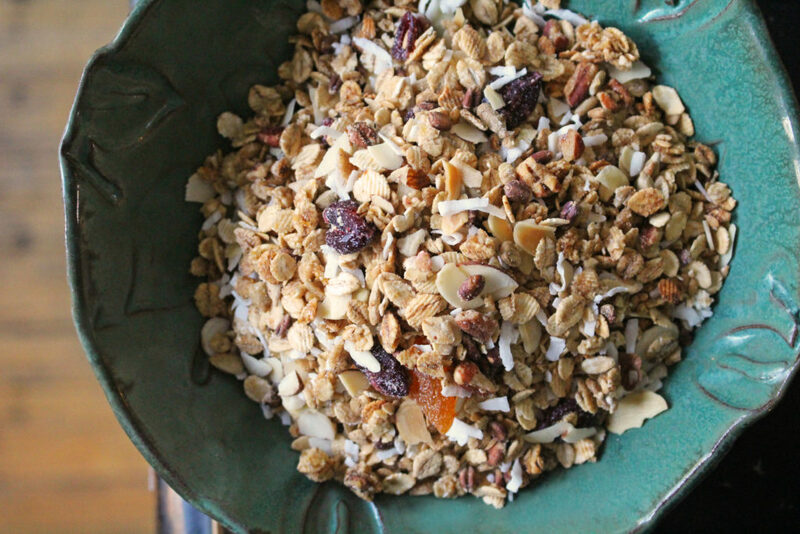 Homemade granola is a virtuous thing. A handful of it will ward off hunger (I keep a ziplock baggie of it in the car at all times) and layering it with some homemade or local Bles Wold vanilla yogurt and frozen berries will give you the healthiest breakfast imaginable. It also makes great muesli, if you stir it into some yogurt along with a grated apple, and pop it in the fridge overnight. Homemade granola also makes a great gift, encased in a big glass mason jar. And it’s far more expensive than most granolas you find on store shelves. Best of all, you can customize it with dried fruit and chopped nuts, and flavours like vanilla or maple extract, cinnamon or ginger, according to your taste.